Saturated with the aromatic flavor of citrus fruit, this Dutch Gold orange blossom honey is a deliciously sweet treat fresh from the blossoms of Florida's orange groves. The unique fragrance makes this a favorite varietal of honey among customers. It is only produced by bees during the spring when the orange trees blossom. Light and golden, this wholesome honey has a sweet flavor offset by citrus undertones and is bottled free from additives and preservatives. It's a naturally sweet way to enrich your favorite recipes! Let this golden honey cascade over desserts, glaze pastries, and sweeten sauces. The fragrant flavor and velvety texture of this orange blossom honey is the perfect complement to a variety of savory dishes, from classic honey-baked ham and sweet breads to sticky honey glazed chicken. Drizzle over yogurt, cereal, and ice cream, or let a few drops of this pure honey dissolve into hot teas. 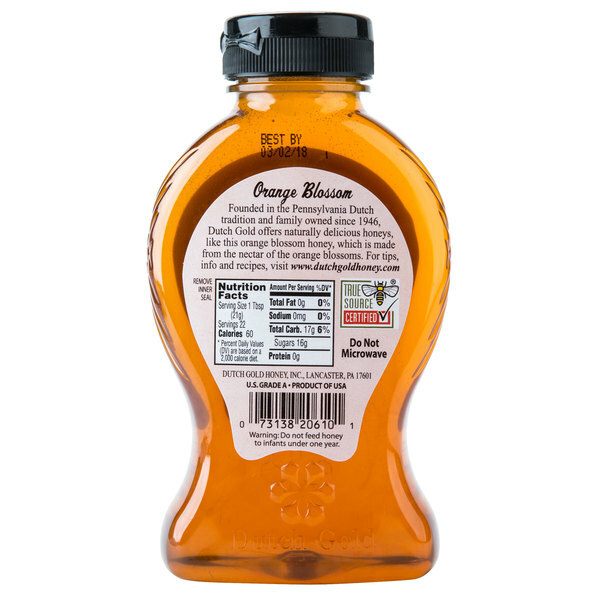 This orange blossom honey is packaged in an easy-grip plastic container for easy pouring with a resealable cap to keep the product fresh. 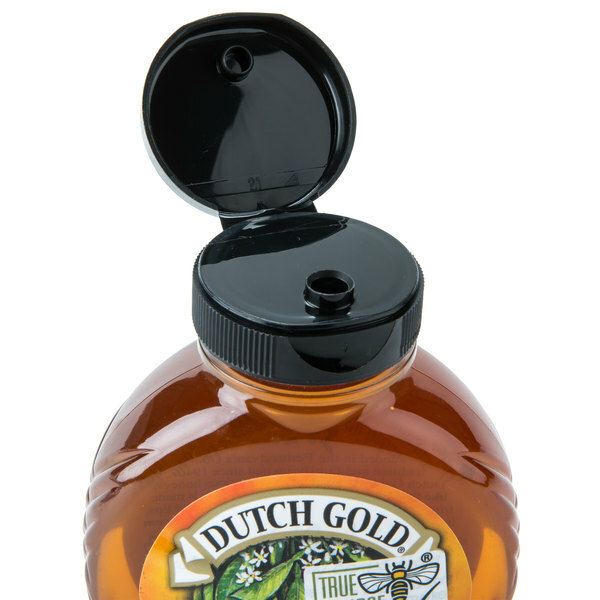 Whether you're using it for back of the house prep or you offer it for table use, Dutch Gold Honey is a trusted brand dedicated to delivering pure and all-natural honeys. Located in the heart of Pennsylvania Dutch Country, Dutch Gold Honey is true source certified, meaning that the honey is ethically sourced in a traceable manner from known beekeepers. 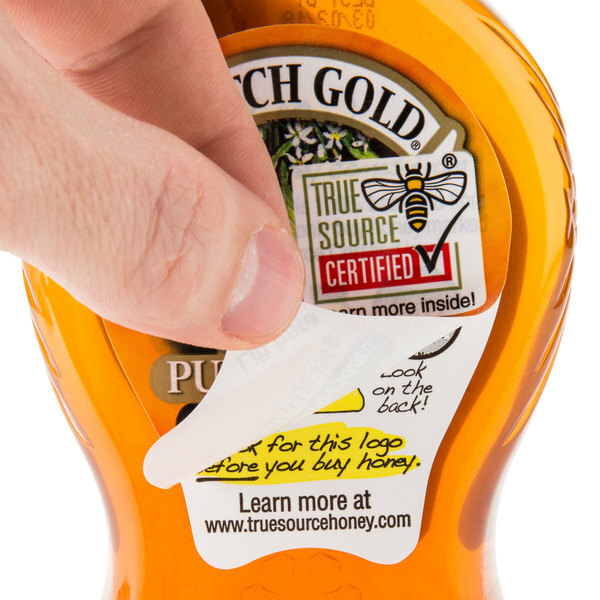 With truthful labeling as to its source, this naturally gluten free and U.S Grade A honey is a quality choice for your restaurant or cafe. This product is ethically sourced in a traceable manner from known beekeepers. Dutch Gold Orange Blossom Honey - 1 lb. My hubby loves this flavor. It has a hint of citrus without losing its "honey-ness." He loves it on toast. 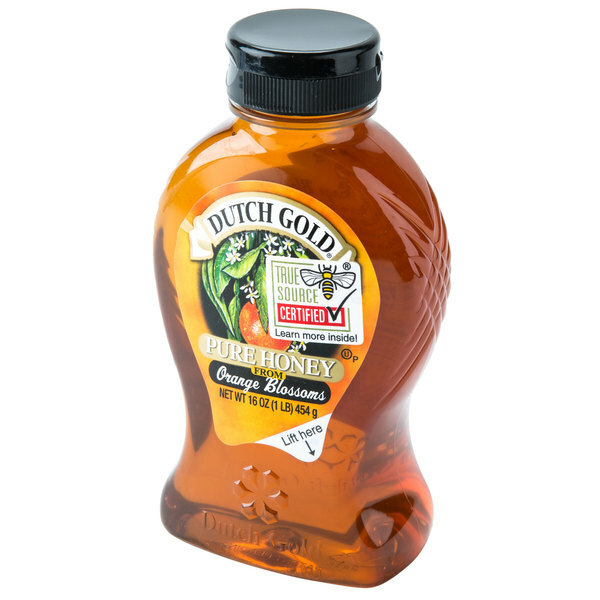 Dutch Gold Orange Blossom Honey is absolutely delicious! It adds a wonderful flavor to both sweet and savory dishes from salad dressings to oatmeal to tea. I absolutely love this in hot tea. It leaves a remarkable flavor that can never be duplicated by other brands. It is worth every cent. I would highly recommend this. This is good if you want a citrus flavor in your food/drink. It's like having some honey with some citrus oil all in one. I love the smell. This honey is delicious. It is so good for you and helps with digestion, arthritis, immunity, muscle pain (especially combined with cinnamon) and is so delicious in herbal tea with the hint of citrus from the orange blossoms! 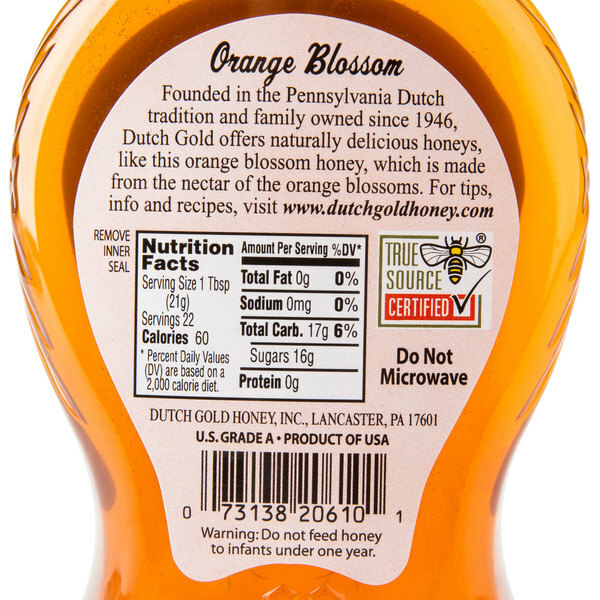 The Dutch Gold Orange Blosso honey has a unique taste that is unbelievably delicious. You can use this in homemade beer, in desserts or tea. Orange blossom honey is simply amazing! You do infact get mild citrus notes from the oranges in the aroma and in the flavor. Its not very overpowering but it is subtle difference that makes for some amazing dishes. People really liked this honey! The only thing that would have been better would have been raw honey from a local trusted source but this did the job well. 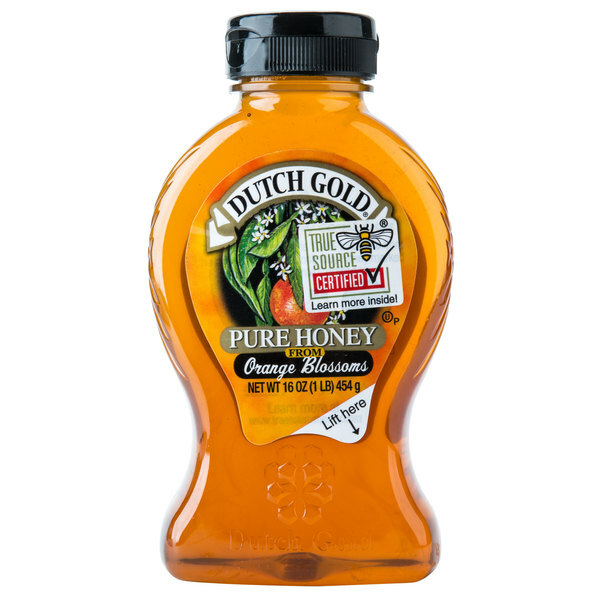 This Dutch Gold 1 pound orange blossom honey is excellent. We use it for cooking and baking and as a sweetener. It has an excellent taste. Very subtle orangle flavor gently coats the palette with this product. A variety of uses in baking as well as on pancakes or even in your morning coffee. This one is good on a variety of different foods. It manily tastes like honey but it has a hint of citrus flavor to it. It is good for morning biscuits especially. My personal favorite of the honey flavors offered. 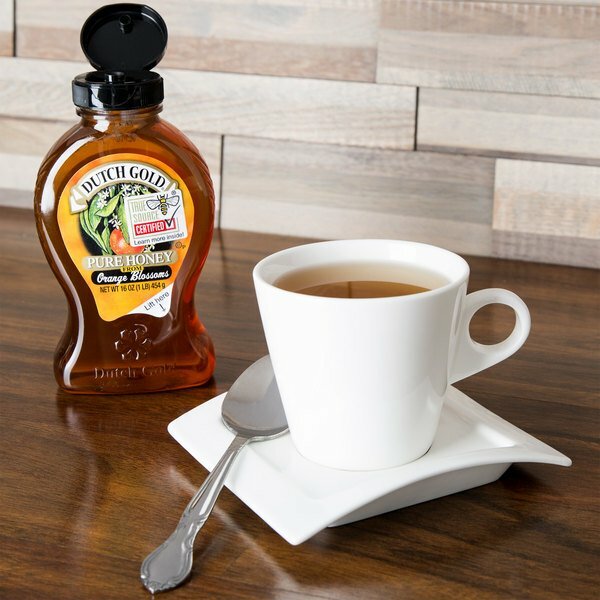 Has a lovely, light sweetness and goes really well in teas with more subtle flavors. Would recommend for anyone who likes their sweet a little subtle. It can be difficult to trust the quality (or even the authenticity) of honey, but this is delicious. We purchased several varieties, and the orange blossom was delicious. This Dutch Gold Orange Blossom honey is wonderful. It has a great taste and a smooth texture. It also tastes great on almond butter sandwiches. Dutch Gold Orange Blossom Honey - 1 lb. Has a delicious light honey taste and an inexpensive price. For breakfast service or casual dining it's a good size bottle to set out as is. I am glad I got this honey I am going to get more I have tried this and other flavors of this honey and its very good grade You will love it. I love orange blossom honey, it reminds me of when I used to live in California. Everyone has different tastes, so I recommend buying the one pound container to try it out. If you like it go big with a five pound container, if not move on. Has a nice delicate orange flavor, that is a nice accompanyment to tea, biscuits, and or pancakes. Bed and breakfast businesses would be a great place for this item.